History magazine programme presented by Helen Castor and Tom Holland. Including what the French really thought about the Allied bombing raids on their cities. Helen Castor and Tom Holland return with the latest research that's Making History. Today's programme includes what the French really thought about the Allied bombing raids on their cities, why the Spanish still can't face remembering their civil war, and London to Great Yarmouth in around 10 minutes - 200 years ago. 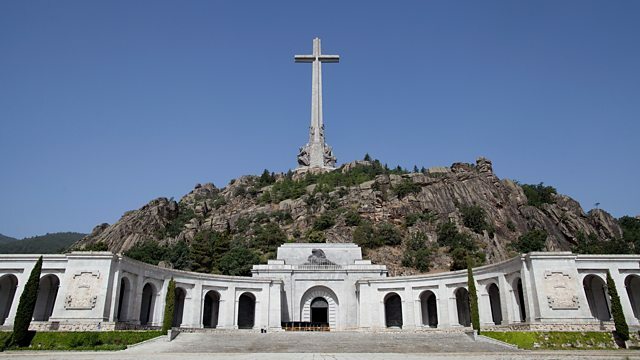 Seventy five years from the end of the Spanish Civil War, Tom Holland visits the Valley of the Fallen 40km north west of Madrid where the Nationalists, under leader General Franco, used Republican slave labour to build a memorial to the war dead. Tom meets with Dr Gareth Stockey from the University of Nottingham and Dr Jorge Marco from the University of Madrid to hear how a nation’s ‘pact of forgetting’ is now weakening as a new generation of Spaniards actively seek to remember and understand the divisive events of their brutal civil war. Seventy years on from D-Day it’s easy to forget the death and destruction that the Allied bombing campaign brought to the people of France. Indeed, as many French civilians died on the day of the landings as Allied servicemen. Dr Simon Kitson has explored how the French population felt about the air war on France in a recent paper and here he talks to Helen about his findings. Making History listener Kay Baker served as a Communications Officer in the Royal Navy for many years. But, it was the colour illustration below, which see saw at the National Maritime Museum in Greenwich, that inspired her to research a forgotten communications system from the Napoleonic era. Kay thinks that this a propaganda cartoon which is re-enforcing the French threat to Britain. What struck her was the object on top of the castle, crowned by a French flag. She thinks its a pictorial representation of a telegraph system with six shutters which, when opened and closed, could send messages via a chain of shutter stations in minutes. These loines of communication ran from the Admiralty in Whitehall to: Chatham and Deal; Portsmouth, Plymouth and Great Yarmouth. Such was her interest that she made the latter the centre for her research when she signed up for a MA in Landscape History at the University of East Anglia. Making History enlisted the help of naval historians Professor Roger Knight at Dr Sam Willis to find out more. Can you help Kay research the Admiralty Shutter Telegraph line from London to Great Yarmouth? This is a list of the stations with their map references. The Making History team would be thrilled if you could send an image of one of the sites below, especially if there is evidence of a former telegraph station. Information on how to contact the Making History team is available here.